I’m sure by now you’ve noticed that casting the everyday into silver and making it some wearable form like jewelry is instant subversive luxe. 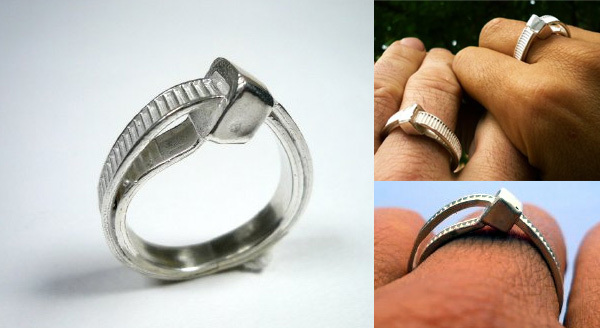 From plastic vampire teeth for belt buckles and cocktail swords as necklaces, to forget me knot strings around the finger and peeled bark as cuffs… so part of me isn’t at all surprised to see that someone has gone and cast zip ties in silver as rings. In fact, i can’t help but wonder why it wasn’t done sooner. Granted i’d probably have to turn down any man who dared propose we marry with a pair of these, the concept certainly has a lot of potential. Personally, i feel like zip ties are the new duct tape… from tying back cables, to tying plants to poles, looping through dishrags to have a loop to hang them from, tying bad guys up instead of handcuffs, locking your suitcases… (i’m sure you have more examples to insert here)… these rings are from Metalnat by Natalie Gomensoro at Supermarket. Actually, I think that was the point. These zip-ties represent the way marriages, built to stay permanently in place have begun to be put together backwards and haphazardly, and tend to just slip apart. These however, were cast in silver, and no matter the original orientation, it still holds fast, because it has been immortalized in something stronger. Or maybe it just didn’t hold the right shape the other way, and wouldn’t be comfortable on a finger, did’ja think of that?!?! Stop being a stupid whiney pants. You’re just jealous that you didn’t think of it first. Your comments were judgmental and pretentious. Lame is an understatment. Why bother creating this if the attention to detail is…non existant. Tripe. Please melt all of them down immediatly.